The growing importance of this Expo is evidenced by a single fact; from last year to this year, its exhibition area has not just increased, but doubled. This part of the Expo was never quiet, with the hiss of detergent dispenser and hum of automatic washers and dryers almost drowning out the scores of queries fielded by the visitors flocking in from multiple sectors. 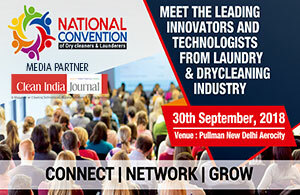 The Railways, in particular, showed in force from all the 16 zones, searching for large-scale solutions to tackle the massive amount of laundry they need to process every day.The Laundrex India Expo, in the fourth edition, surpassed the previous year, with exhibitors occupying double the size of space. Many new exhibitors were equally eager to promote their all-new products and services, which were the perfect union of tech and hardware designed to launch India’s laundry segment well into the middle of the 21st century. Many visitors who mobbed this section were investors looking to become franchisees of established laundry chains, start- ups from West Bengal, Gurgaon, Pune, Madhya Pradesh, Orissa… Consequently, exhibitors went beyond products, and offered a wide range of support partnerships as well. It was a common sight to have sales personnel deliberately apply a stain to a garment, then employ his company’s product to make it vanish in a matter of minutes. The products at some stalls were ground-breaking, where even after a live demo ended, the demonstrator wasn’t allowed to relinquish his mic by a crowd of visitors who wanted to know every last thing about the product. Abhijit Dey, Proprietor-Deys Ice Suppliers: The Show was excellent. Like the last few years, it was a very good initiative. The expo was well set. It will be very helpful to get the unorganised sector with DLAI. Overall, it was a very nice experience and I am glad to be a part of it. Amit Nath, Managing Director- Spinwash: It was a new exploration of an industry which is taken as a sad service industry. Recycling tools and laundry water recycling is much required. This is a great initiative. Anil Kumar, Proprietor-Mak & Mak: Being a new comer, it was a learning experience. I had no specific product requirement, but became interested in every aspect of the industry. Yes, I got most of the answers I was looking for and felt very confident after having gone through the sessions at LaundrexNet and displays at the Show and my interactions with industry seniors… The new Spirit among st people to join together towards betterment of the people and procedures for the Industry was encouraging.